Just when you thought only the plantings at the Atlanta Botanical Garden go through seasonal transitions, now so do the living sculptures. Enter...Ice Goddess. If you saw Earth Goddess during Imaginary Worlds: Plants Larger than Life this past summer, you know how magnificent she was. 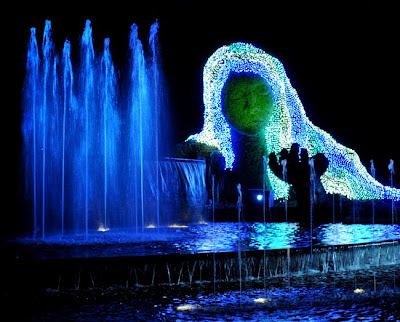 She's since blossomed into Ice Goddess...I believe the most brilliant gem in Garden Lights, Holiday Nights exhibition. So...you're wondering how a living sculpture is going to survive a frigid Atlanta winter? Not to worry. Garden engineers have introduced heating elements inside Ice Goddess's head and hand...it's quite remarkable, really. When you visit the Garden for Garden Lights, Holiday Nights, be sure to take a stroll along the Canopy Walk and stop to visit with Ice Goddess.